Aparthotel Andorra is located in the south coast of Tenerife, one of the wonderful canarian islands. 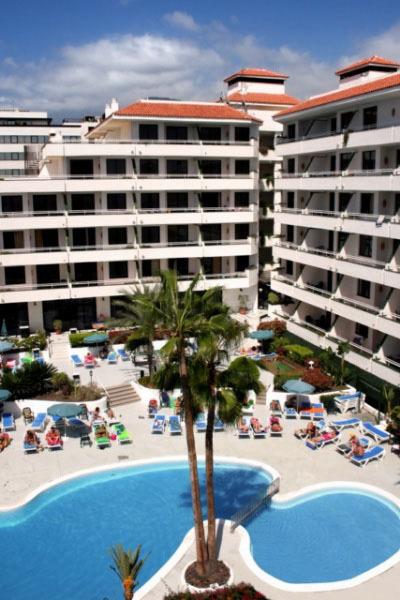 Located in one of the most important touristic areas of Tenerife. The privileged situation and excelent climate offers a perfect atmosphere for families near beaches and sun. Apt-hotel with privileged position in Playa de las Américas, only 5 min. from Golf court "Los Cristianos" and the wonderful beaches "Los Cristianos and Las Vistas". You will find different shopping-centers and if you like, there are possibilitys to practice your favorite sport at the olympic stadium 200m. from the hotel, where you can practice sports like athletics, football, boxing, fitnis and so on. Everything is near, pleasant atmosphere and the climate plays an important roll for choose our hotel for a rest entertainment and amusement. Our facilities include 24 hour reception, bar, Pool bar, Restaurant, Parking, solarium, gardens and pool (heated in winter) with children's section, plus our ramps and disabled access, making our resort an ideal place to relax and bring comfort to your vacation on the island. In reception there is a currency exchange, car and motorcycle rent, tours, telephone and fax service. It may also provide, if you want, our laundry service. The aparthotel Andorra has 100 cosy one single rooms, where you can feel like at home. All rooms are equipped with a kitchen, complet bathroom with hairdryer, living room, telephone, music channel, air conditioning, tv and safe for rent and a balcony with different views. We have as well 3 rooms adapted for the disabled, equipped like the other rooms. Overall rooms for enjoy your holidays. You can find two pools, one heated in the winter months, plus two swimming pools for the little ones also enjoy the sun and water.